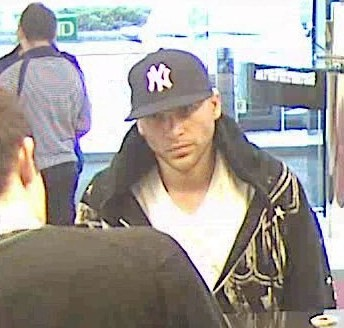 On 10-19-11 at 1634hrs the pictured suspect entered the Roselle TD Bank located at 37 St. Georges Ave.
No weapon was shown, the suspect exited the bank with approx. $2000 in cash. The suspect possibly fled the scene in a dark blue Honda. Anyone with information is urged to contact Det. Lt. Jim Loprete at (908) 245-9200.